Paul Howard, author of I Read the News Today, Oh Boy, introduces the music that inspired, and was in turn inspired by, Tara Browne, from Bobby Darin and The Everly Brothers to The Beatles and The Rolling Stones. Growing up in Ireland as the son of two aristocratic dynasties, the first music he was exposed to came in the form of classical and opera. Later, he developed a love of traditional Irish music. As a teenager, he travelled around Ireland with his older brother, Garech, recording singers and musicians on a Grundig two-reel tape recorder. These recordings represented the beginning of Claddagh Records, a label that was central to the revival of traditional Irish music, beginning in the early 1960s. It was in 1959, when he moved to Paris with his mother, Oonagh Guinness, that he first became aware of the new music that was making its way across the Atlantic: rock and roll. He bought box-loads of 45s by mail order from America and played them on a small, portable record player, that folded into a little case. As a teenager, his musical tastes were eclectic. He loved the sugary pop tunes of Bobby Darin and The Everly Brothers. But he also frequented the subterranean jazz clubs of Paris in the company of his older, English friends. It was through jazz that he discovered rhythm and blues. He liked edgy music that sounded good when it was played loud – anything by Howlin’ Wolf or Oscar Brown Junior. And he adored Ray Charles and saw him play live in France. He loved anything new, especially dance crazes. He discovered Chubby Checker in the early 1960s. His mother later hired a member of Chubby Checker’s entourage to teach her son the 'Twist', which the Daily Mail photographed him performing at – of all things! – a debutante ball. When he moved to London in 1962, he started moving in a social circle that included the Rolling Stones, whose music he much preferred to that of The Beatles. He liked some of the Beat music of the British Invasion. But his favourite band were The Beach Boys, since they sang about three of his main obsessions – cars, girls and fun. As a well-dressed member of the ‘Carnabetian Army’ sent up by Ray Davies, he loved 'Dedicated Follower of Fashion' by The Kinks. He and Nicki’s favourite song together was Sonny & Cher’s 'I Got You Babe' – its lyrics spoke to them at a time when their marriage was coming under pressure from external forces, including Tara’s disapproving mother. In 1965, he became close to Brian Jones, who introduced him to the music of The Lovin’ Sponful. In April 1966, Oonagh hired the band – then one of the biggest acts in America – to play at his 21st birthday party in Luggala, her spectacular Irish home in the hills of County Wicklow. Present at the party were Brian and Mick Jagger, who had just finished work on their album, 'Aftermath'. Paul McCartney sent his apologies. The Beatles were recording the album that would become 'Revolver'. 'Revolver' was one of the three records released that summer that figure in most authoritative lists of All Time Greatest albums – the others being 'Pet Sounds' by The Beach Boys and 'Blonde on Blonde' by Bob Dylan. Those records became the soundtrack of the summer of 1966 around at Tara’s mews in Eaton Row, where his friends – including Paul McCartney, Peter Sellers and several Stones - gravitated after the clubs of the West End had closed. It was Tara’s last summer. A week before Christmas, he crashed his friend’s Lotus Elan into a stationary van in London, prompting John Lennon to write the opening stanzas of 'A Day in the Life' in reference to his death. Around the same time, The Pretty Things wrote 'Death of a Socialite' about him. The following playlist is made up of songs that Tara loved and songs that his friends still associate him with fifty years after his death. 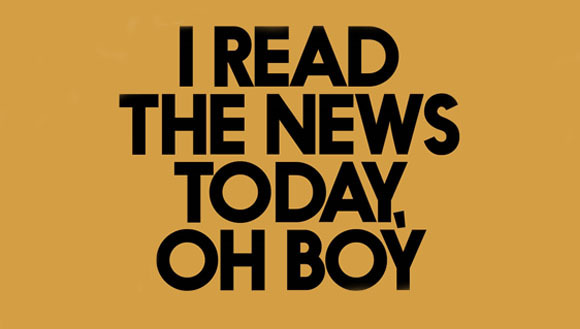 Paul Howard's award-winning biography of Tara Browne, I Read the News Today, Oh Boy, is out now.